I am thinking it is looking more and more likely the next Liberal leader will be either Jess Spindler or Nathalie des Rosiers as those are probably some of the few who will likely survive the blue/orange tsunami that is about to sweep the province. Unfortunately the party may be so badly damaged it will be about just keeping it afloat rather than having a shot at power. Whomever is the next Liberal leader is going to have a hard and thankless job. That being said it looks like Ontario is moving towards the same political set up the Western provinces, UK, and Australia have which is a centre-right party vs a social democratic one and a small insignificant centrist one (sort of like Liberal Democrats in the UK, Liberals in Manitoba or Alberta Party). Off course maybe the Liberals will do better than expected but time is running out. I told Jess she’d be leader weeks ago. She thought I was joking. I wasn’t. And not being tied to the past government as well as young enough to be in it for the long haul, I think she would be a good choice for leader, that is provided she wins her riding. I still think she will, but if the Liberals continue to slide, there is a chance of getting zero seats. Lets remember they are now polling below what Stockwell Day got in Ontario in 2000 and that netted him only 2 seats. There’s a distinct problem as regards the necessary learning curve as leader when that person is relatively inexperienced. They tend to rely far too much on aides who aren’t really up to the task. Hence, serious serial mistakes and significant dips in the polls. It’s a self-fulfilling prophecy. And if not checked, a train wreck. This is not a shot at Ipsos, but the last few polls run by bunch of companies, the smaller the sample size, the smaller the gap between the OPC and NDP. I think the Forum one was only around 750 people. The larger the sample size, the larger the gap between the OPC and NDP. Ha! A few minutes ago I left a comment in your “Campaigns Don’t Matter” post stating that if other polls corroborate Forum’s PC-NDP gap narrowing, momentum would shift to the NDP and the Liberals get squeezed down. Well here it is. 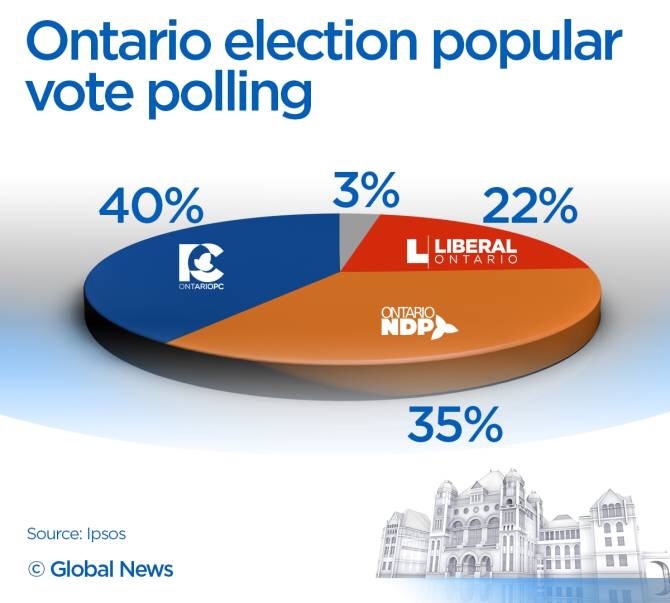 Poll #2 showing NDP within striking distance. How low can the Liberals go? The federal Liberals bottomed out at 18% in 2011. The federal PCs at 16% in 1993 (though adding on Reform the centre-right was still around 30%). I can’t see the ON Libs going lower than the Ignatieff Libs so we should be scraping the bottom of their support around here. Which means that, assuming Horwath cannot generate swaths of brand new voters à la Justin Trudeau, she will need to go after Ford in Conservative leaning seats in the 905 and SW Ontario. I could see the OLP going lower then Iggatiff did, Iggy might not have been popular, but he wasn’t scandal riddeb, the NDP back in 2011 only began surging mid campaign and people were still in disbelief. This time the libs are crushed by scandal, the NDPs succesa spiral started earilier in the campaign. Plus alot of people outside Ford nation do NOT want Ford to win, deseperately so. So I think 14% for the OLP is possible. He has to be resurrected before he takes the white. This is surely the necessary course of things. Isn’t the popular vote a rather meaningless measure, though? It’s actually all about ridings and vote distribution, and last time I looked (about a week ago) Ford was poised to win 3 times as many seats as Horwath. Has that changed? I think it is down to double. But if you have a 20 point lead vs. 5 it makes a big difference in seats. Off course we will have to see if the NDP surge continues or levels off. No, but if would just take a change of a few more percentage points and it could.